By the 1960s, Japanese Americans were no longer confined to living in the Japantowns of San Jose, Los Angeles, and San Francisco, or the family farm. They moved out and were able to purchase homes in middle class suburban neighborhoods. The Sansei (third generation) children had lives filled with school activities, sports, and summer vacations, instead of long days spent toiling in the fields of the family farm. 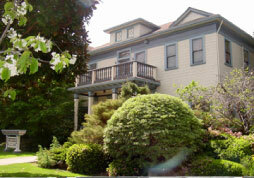 Still, San Jose's Nihonmachi continued to serve as the heart of the Japanese American community. The Buddhist Church Betsuin, Wesley United Methodist Church, and the Issei Memorial Building (formerly the Kuwabara Hospital) became the focal point of activities. Over the next twenty years, as Silicon Valley began to grow and develop, the remaining Japanese American farmers began to sell their land. Office buildings inhabited by high tech companies and tract housing replaced the acreage once owned by Japanese American farmers. The Sansei (third generation) grew up at a very different time than their Nisei parents. Their parents had experienced the dislocating effects of the war—incarcerated in American concentration camps. The Sansei grew up as a part of the "baby boomer" generation, born after the end of World War II through the beginning of the 1960s. The Civil Rights era profoundly influenced the college educated Sansei, who began to question the internment and the violation of civil liberties. In the late 1960s and early 1970s a grassroots movement began on college campuses to demand redress and a formal apology from the United States government. The beginnings of redress began as soon as the camps closed in 1946. In 1948, the Evacuations Claims Act gave some redress in the form of monetary compensation for losses incurred from the wartime evacuation. But many believe that the compensation was inadequate, with the government paying only ten cents for every dollar of property loss that could be documented. It was not until 1978 that the Japanese American Citizens League formally took a position and began to seek redress for those individuals who were forced to evacuate and move from their homes due to the war. The JACL and the National Committee for Redress decided to pursue redress through legislative action and worked with Congress to establish a government commission to study the effects of the displacement of citizens during World War II. In 1981, the Commission on Wartime Relocation and Evacuation of Civilians (CWRIC) was formed. It was charged with holding hearings in cities throughout the United States and gathered testimony from former internees about their evacuation and living conditions. These oral hearings, coupled with voluminous research about the World War II evacuation and internment program, produced the Commission's important landmark book, Personal Justice Denied. 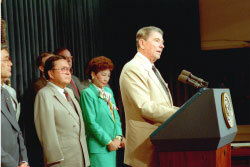 President Ronald Reagan, flanked by Japanese American leaders, August 10, 1988 at the signing ceremony of the Civil Liberties Act that finally gave Japanese Americans redress and reparations. 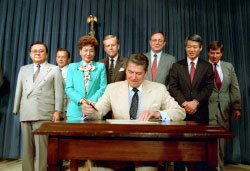 President Ronald Reagan Library From left to right: Sen. Daniel Inouye (HI), unidentified observer, Rep. Patricia Saiki (HI), Sen. Pete Wilson (CA), President Reagan, Rep. Don Young (AK), Rep. Robert Matsui (CA) and Robert K. Bratt, Justice Dept. Administrator. Ronald Reagan Presidential Library. Three other very important cases were also brought to light in the 1980s. In separate cases, Fred Korematsu, Minoru Yasui, and Gordon Hirabayashi challenged the curfew and evacuation orders issued by the government. Their cases were heard by the U.S. Supreme Court and the Court found that the government had the right to enact the curfew and evacuation orders because it was wartime. In the early 1980s, legal historian Peter Irons found documents that showed the government had intentionally dismissed evidence that Japanese Americans would not be a security threat to the U.S. government. This allowed Korematsu, Yasui, and Hirabayashi, to return to their court cases that were heard by the Supreme Court in 1944. Thus, this new information led to the reevaluation of the original court convictions. This, coupled with the growing momentum for Redress, made the stage ripe for developing a mass movement to work through legislative and grass roots channels to campaign for monetary redress for former evacuees and internees. By the late 1980s, with the assistance of Japanese American senators and congressman, Congress had approved the passage of redress funds for former internees who were moved and relocated during World War II. Redress payments of $20,000 were paid to the oldest survivors first. In successive years, other survivors received their compensation. 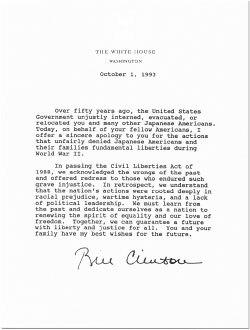 Individuals received a formal letter of apology from the President, either George Bush (Sr.) or Bill Clinton (depending on the time of the receipt of the application). For many Japanese Americans, the monetary compensation was not the main goal. Redress and reparations funds needed to go beyond that, providing educational programs and materials that would educate the public about the issues of civil rights and liberties in the United States. The Japanese American experience can serve as an example of the rights of citizens and to educate today's population about the importance of learning from history. There are very few books on the topic of Japanese American redress and reparation for younger students. However, new material is being published continuously and more books may be available in the future. Commission on Wartime Relocation and Internment of Civilians. Personal Justice Denied. Washington, D.C. U.S. Government Printing Office, 1982. Comprehensive report on evacuation and internment of Japanese, Aleuts, and Pribolof Islanders during World War II. Hatamiya, Leslie T. Righting a Wrong: Japanese Americans and the Passage of the Civil Liberties Act of 1988 (1994) Stanford University Press, ISBN: 0804723664. Hatamiya describes the story of the long and bitter political struggle in Congress to pass the Civil Liberties Act of 1988, a law to pay reparations to former camp inmates. Irons, Peter. Justice Delayed: The Record of the Japanese American Internment Cases (1989) Wesleyan University Press, ASIN: 0819561754. Takezawa, Yasuko. 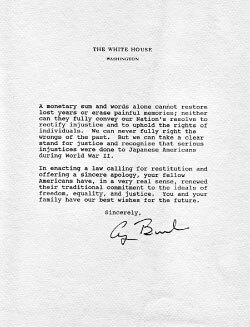 Breaking the Silence: Redress and Japanese American Ethnicity. (1995) Cornell University Press, ISBN: 0801481813. This book is an anthology of works about the Redress and talks in depth about Day of Remembrance. Available at Amazon.com. California Civil Liberties Public Education Program at www.library.ca.gov/grants/cclpep/ The California Civil Liberties Public Education Program (CCLPEP) was created in 1999 as the result of the passage of the California Civil Liberties Public Education Act sponsored by Assemblymember Mike Honda and others. The legislation creates the California Civil Liberties Public Education Program, (CCLPEP). Its purpose is to provide competitive grants for public educational activities and the development of educational materials to ensure that the events surrounding the exclusion, forced removal and incarceration of civilians and permanent resident aliens of Japanese ancestry will be remembered and so that causes and circumstances of this and similar events may be illuminated and understood. Japanese American Citizens League at www.jacl.org. The Japanese American Citizens League (JACL) is a membership organization whose mission is to secure and maintain the human and civil rights of Americans of Japanese ancestry and others victimized by injustice. Teachers may also order curriculum guides directly from the web site. National Archives www.archives.gov/research/japanese-americans/ This on-line area is specific to the Japanese American experience during World War II. Included are many links including those to a database listing the names of most of the internees (based on 1940s records), Nisei military records, and twenty days of Congressional testimony which eventually led to the Civil Liberties Act of 1988.